SAO PAULO, Brazil – There were a couple of things most fans wanted to see in the final games of this World Cup. Yet, neither will be on display in today’s semifinal game between Germany and host Brazil in Belo Horizonte. The first is Neymar, the 22-year-old star striker and heir apparent to the long line of legendary Brazilian players that runs from Zizinho to Garrincha to Pele, then down through Zico, Romario, Rivaldo, Ronaldo and Ronaldinho. That’s because Neymar is out for the rest of the World Cup because of a fractured vertebra. The second thing missing for Brazil on Tuesday will be the flowing, free-form style of play those eight former World Cup stars made famous, a style two-time world champion Didi called the “jogo bonito,” or beautiful game. And you can blame the loss of the first one on the absence of the second one. 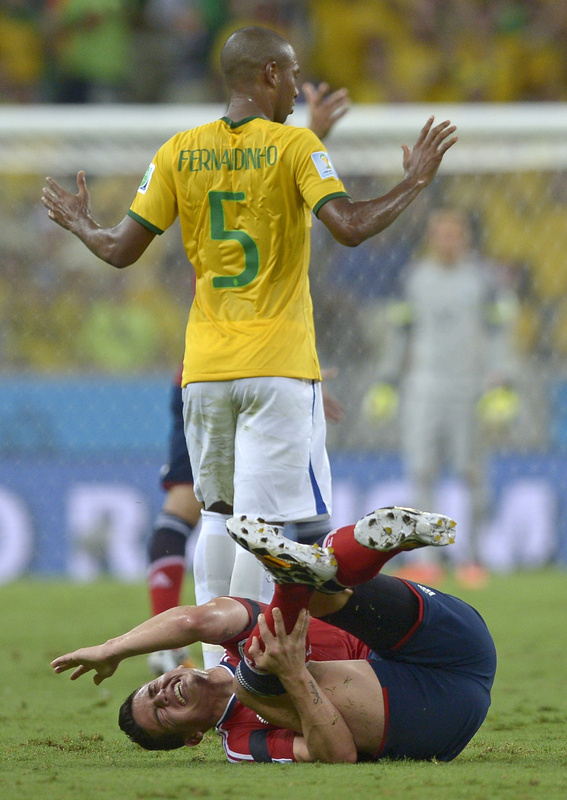 Brazil has committed 96 fouls, more than any other team in this World Cup. It has also suffered the most fouls and earned the most yellow cards, resulting in a halting, physical and unattractive style of play more suited to the NFC North than the World Cup. Call it the “jogo violento,” the violent game. Under enormous pressure to win at all cost and justify the record $11.5 billion the government spent to put on this World Cup, Brazilian Coach Luiz Felipe Scolari decided that winning ugly was preferable to losing with grace and beauty. He did it the other way in 2002, when he led Brazil to its last World Cup title behind Ronaldo and Rivaldo, who combined for 13 goals. Four Brazilians made the all-tournament team that year. This year’s Brazilian team has a better chance of touring with the WWE. And now with Neymar sidelined, Scolari is fresh out of Ronaldos and Rivaldos. But he does have a thick-necked winger whose name, Hulk, was earned through attributes that have little to do with soccer skills. The kind of game Scolari has decided to play in this World Cup is about as Brazilian as the polka. And Brazil’s not very good at it, which is why the team has looked so uncomfortable, failing to score against Mexico and needing penalty kicks to beat Chile. Which raises the argument that Neymar will sit out the rest of the tournament because of it. In last week’s quarterfinal game with Colombia, Scolari decided the best way to control James Rodriguez, the 22-year-old gifted striker, was to pummel, push and pound him. And although Spanish referee Carlos Velasco Carballo called a 2014 World Cup-high 54 fouls, 31 on Brazil, he showed only four yellow cards, which allowed the physical play to continue. Fernandinho, who has 12 fouls in 206 minutes of World Cup play, was Brazil’s designated goon, a hockey-style enforcer assigned to take Rodriguez out of his rhythm. It’s an idea not without precedent. In the 1982 World Cup, Italy’s Claudio Gentile fouled Argentina’s Diego Maradona 23 times, holding him scoreless in Italy’s 2-1 victory. Italy went on to win the title. That the strategy may also have worked for Brazil here really isn’t the point because in the end Colombia apparently felt the best way to protect Rodriguez was to target Brazil’s top player, Neymar, whose penchant for diving helped him draw 18 fouls in five games, sixth-most in the tournament. So now Scolari has to come up with a new plan since Germany’s attack is so potent and so diverse, beating up one guy will only open the field for two or three others. Brazil’s violent play already has the Germans looking over their shoulders, though. And, of course, Scolari must also come up with a replacement for Neymar. With few reliable options up front, he’ll likely go with Willian, who has never started for the national team, as an additional midfielder. Or he could go with a decidedly un-Brazilian tactic and scrap the attack all together, using Luiz Gustavo as one of three defensive midfielders. “We are a team, and a team is not made up only of strikers,” Scolari told reporters. “We have a group. … We have good players for the sector where Neymar played.